Sign up below on our Artisan Advantage Program and automatically receive it along with other great free benefits. We MOVED in October 2012. Click Here for details. All colors and sizes Now 50% OFF until it's gone! Limited to stock on hand. Inventory will be updated regularly. Our most popular pointed tweezers. The stainless steel that they are made from is thicker, giving you a more working time before they get too hot. One of the most popular lampworking tools of all time. The graphite of the original Stump Shaper is 2½" in length. The long version is 4". Our popular Baroque Shaper has three profile sizes to make ½" (12.7 mm), ¾" (19 mm) and 1" (25.4 mm) long beads. Pictured are two beads made in the medium size profile, with one decorated, and one large bead. There are four 90º V-grooves, each at a different depth. Shape glass on or off the mandrel, aligned with or perpendicular to the grooves. A million-and-one uses. These fine lampworking tweezers are just like the ones you find in Italy at up to twice the price. With beautiful fit and finish, these tweezers are a true pleasure to work with. The 6" and 8" sizes are the most popular. However, the newest 7" size may be just what you are looking for. It is made by cutting down the 8" tweezers in order to make the tip just a little wider. The 5" size comes from the 6" ones for the same reason. Italian Style Tweezers aren't just for pinching off bits of glass. They also make for great detail mashers, leaving their profile behind in the glass. The model ASC/5 digital ramping controller holds 9 programs in permanent memory for annealing, fusing, Precious Metal Clay, enameling, jewelry wax burnout and ceramics. It is so simple that all you need to do is press a few buttons and it will perform the program and then turn itself off. For your convenience, several programs have already been entered, all of which can be easily changed. If you have special firing programs you regularly use, we will gladly program them into the controller for you. The controller is configurable for either Fahrenheit or Celsius. 15 or 20 Amp, 120 Volt models; and 20, 30 or 50 Amp, 240 volt models available. 30 and 50 Amp, 240 volt models come is a larger housing, not pictured. The ASC/5 is a "STAND ALONE" controller, which means that it is not attached to an oven, has its relay self-contained, has an installed thermocouple, and a plug and receptacle. All you need to do is plug the controller into a wall outlet, plug your oven into the controller, and insert the thermocouple (temperature sensor) into the oven. As you probably already know, many of our tools are based on tweezers. Some we re-profile their tips for special applications. Others, we make various sizes and shapes of stainless steel squares and patterns and weld or braze them to tweezers. Always looking to develop new tools and to improve on existing ones, we have come up with an improved, very robust, ergonomic tweezers design. As you can see in the pictures, they are easier to hold, and importantly, easier to use. Angled Tweezers Mashers are for profiling the bottom of heart shaped beads and more. Strong gripping regular hemostats hold wire loops for making buttons, leaves, flowers and other small glass items and components very well, but by their design, they are awkward to hold and rotate like a mandrel. So, we have mounted a 5/32" mandrel to a 3½" hemostat so you can easily hold and rotate your glass project on center. For use with 16 gauge wire and smaller. 12" overall length. The newest 2" size not only makes 2" cabochons, but also can be used like a painter's palette to make one or more irregular pieces at a time across its face. All 12 diameters are available with 9" or 12" length handles. Pictured are 1/2", 5/8", 3/4" and 1". Our round Cabochon Mandrels come in 12 diameters, from ½" to 1", by 1/16" increments, plus 1¼", 1½" and 2". They feature a thicker 5/32" handle for more a comfortable grip and your choice of a 9" (23cm) or 12" (30cm) length. For regular bead mandrels, where you mostly hold the mandrel level, the 12" length is more popular. 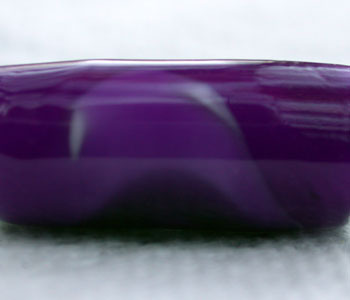 Cabochon mandrels are typically used more in an up and down direction, therefor you might prefer the 9" length so it doesn't bump the table and other objects. Millimeter equivalents listed with each size. See IMPORTANT details below or click here. The JC Metal Sifters and JC Line & Dot Applicators. These tools dispense frit, powdered glass and enamels by shaking, tapping, or for the greatest control, by moving the Coil Actuator. It is incredibly easy to use. With just one hand, you hold the Sifter or Applicator and move the Coil Actuator forward and backward with either your finger or thumb. You easily control the volume of glass or enamel, from a gentle sprinkle to a heavy flow, by the pressure applied and the speed you move the Coil Actuator. The standard screen mesh size for the sifters is 60. This gives good flow, yet also gives you great control for shading. A 60 mesh screen is generally preferred for its ability for shading as well as its ability to efficiently cover a small item, such as a bead, quickly. We also offer all the Sifters in a 40 mesh screen. You may be familiar with this size, as that is what is in the red plastic bodied sifters. Enamellists also like the 40 mesh screen for its ability to cover a large area quickly and thoroughly. The two largest sizes are not pictured. Sifters Size Chart. Dip-n-Go SLUDGE ULTRA mandrel release is hands down the best. Flame driable, strong holding while working, yet easy to release when the bead cools. The best mandrel release for any diameter mandrel or length bead. Dip-n-Go SLUDGE ULTRA mandrel release is hands down the best. Unlike a regular assortment, we packaged six ½ ounce (14 grams) colors separately. A great bargain at less than $3 per ounce. Quantities limited. 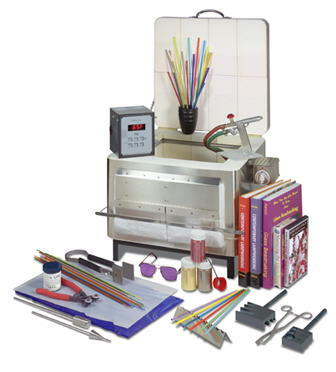 For making glass components at the end of straight or looped wires, commonly used in broaches, bangles and pendants. Made from an extra strong stainless steel alligator clip to provide a secure hold and welded to a 3/16" stainless steel tube. Stainless steel doesn't conduct heat well, so the tool stays cool in your hand. Hollow through and through, so any length of wire can be inserted. Overall length 7½". Accepts non rigid wires up to 16 gage (1.3mm). On Orders of $75.00 or more. Arrow Springs is offering $7.00 UPS Ground Shipping to anywhere within the contiguous 48 states, with a generous Shipping allowance to everywhere else in the universe, when you place an order for $75.00 or more in merchandise (Glass, Hand Tools, Equipment and Supplies) from our website using the shopping cart. Excludes ovens (Annealers, Kilns, Fusers and Extension Rings). The website shopping cart will generate shipping charges as it usually does. We will make shipping charge adjustments as we process your order. Many small orders ship for their actual shipping cost of about $4, even though the Shopping Cart inserts a $12 placeholder charge. The price will be adjusted down. See Shipping Details and Limitations. 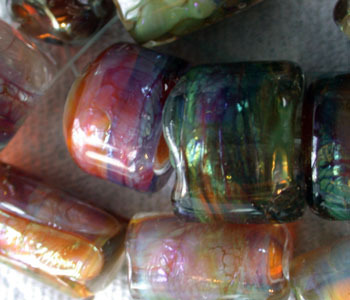 We are now offering BellaDonna Glass in shards, starting with reducing color Dragon Scales. Shards are made by blowing large, thin bubbles of glass and breaking them into random sized pieces. The application of shards to a glass surface has a beautiful effect that cannot be duplicated using a glass rod. Because of their thinness, an ounce of shards goes a long way. Beads by Barbara Terrill. The Arrow Springs Hand and Arm Rest is everything you expect it should be and more. Starting with a stout chassis, we mounted swept back wings, one on each side. Without the use of tools the wings easily adjust to a custom fit for hours of lampworking enjoyment. The wings adjust up and down so you can properly hold your glass rods and tools in alignment with the flame comfortably. They also rotate so the angle of their generous 2½" (6.3cm) padded width conforms to your forearm or wrist or hand comfortably. Get the idea here, ergonomics and comfort. If you can work comfortably, you can work better and longer and enjoy it more. From tip-to-tip, the wing span is 22" (56cm), yet with their cantilevered design, you can easily reach under them when you need to present the glass or tool from under the flame. Now for the really cool part: between the wings is a snap-in graphite pad with a very generous 2½" x 3¾" working area. The graphite pad that comes standard is smooth on both sides. Use the second side should you damage the first or carve patterns or molds into it for an infinite variety of possibilities. Custom graphite molds are available upon request. Changing the graphite is literally a snap. 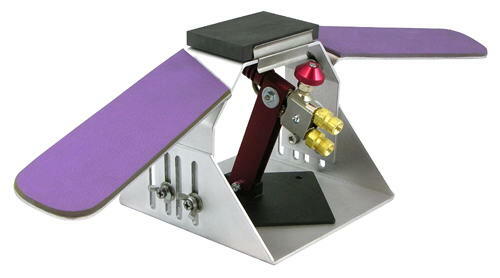 Finally, at the center of the Hand and Arm Rest the chassis adjusts securely around your torch. With four base positions forward to back and height adjustment, The Standard Height Range version perfectly mates with the following torches or other torches of similar size or shape: Minor Burner, Mega Minor Burner, Mini CC, WildCat, HellCat, Little Dragon 7 Bead Burner, Little Dragon 21 Bead Burner, Bullet Burner, Cricket, Bobcat, Lynx and Cheetah. The Tall Height Range version is for taller torches, such as Nortel's Mid Range and two flame torches and most large GTT torches. Read more about which Hand and Arm Rest fits best for your torch. Includes 4" C-clamp to secure torch and Hand and Arm Rest to your work table. Torch not included. Inserts for making glass knobs for cupboard doors, drawers, boxes and more. These ¼" (6.35mm) outside diameter, stainless steel inserts come in two lengths. The more common ¾" (19mm) length and a shorter ½" (12.7mm) length. Inserts have a hole in only one end and are threaded to accept the included, standard 1" (25.4mm) long, number 8-32 screw. Simply screw an insert onto the 12" (30cm) long stainless steel Insert Mandrel and apply molten glass to the insert. After you have made your beautiful knob, anneal it well. See our Graphite Button and Knob Mold. Allows you to connect multiple oxygen concentrators (also known as oxygen generators) to a single oxygen hose for your torch for higher performance. Pictured is the Double for connecting 2 Oxygen Concentrator/Generators. Our new Mini Leaf Mashing Tweezers make realistic miniature leaves for many applications. Very popular right now are 3D multi-component sculptures and brooches. Small leaves, flowers and whimsical lampworked components are created at the end of flexible wire. These parts are then wired together to a central point to create some of the most incredible 3D lampworked art. Additional uses include leaf dangles on jewelry and components that are flame attached to larger pieces. The vein pattern is hand cut on each tweezers for a realistic, natural look. 7" long. This Deluxe Bead and Mandrel Rack is the ultimate annealer accessory. Bigger, better, and much tougher than the original mandrel rest while giving you up to twice as much mandrel capacity. Properly placing your beads in the annealer is a great way to avoid denting or the sticking of your beads. With a stable base and 2¾" height, the rack safely suspends all your beads, preventing them from touching each other or the annealer and becoming damaged. Use the front tier to rest your mandrel on, or choose the back tier, with its larger holes, to insert the tip of your mandrel in. Choose the size that best fits your annealer, 8" or 12" width. Depth measures 2½" between the perforated panels and 2½ behind the back panel for stability. Need it customized for your annealer or special application? No Problem, just ask. These 1½" diameter, 2mm wall thickness tubes of Clear 104 COE glass were originally a casino chandelier. Now they're ready to become whatever you transform them into - Ornaments, vessels and more!. Quartz tubing makes the ideal material to hold Fine Silver or 24 Karat Gold for fuming glass. Quartz, with its low COE of 8, is extremely shock resistant and requires an immense amount of heat to melt, thereby giving you secure control of the molten metal during the fuming process when it is placed in a small depression. 11 mm OD, 8 mm ID, 8" (20 cm) long. To use the Plain Quartz Tubing for fuming, heat up a spot near one end until white hot. Then push a slight depression into the side of the tube with the tip of tweezers. The heating can be accomplished using a beadmaking size torch turned up to its maximum setting if you are using bottled oxygen. If you are using an Oxygen Concentrator/Generator the flame will not likely be hot enough. Purchase the Quartz Tubing with the Depression already in it. Caution: always point the end of any tubing downstream to the flame to prevent the flame from entering the tubing and burning your hand. Dazzling frit mixes for COE 96 and 104. 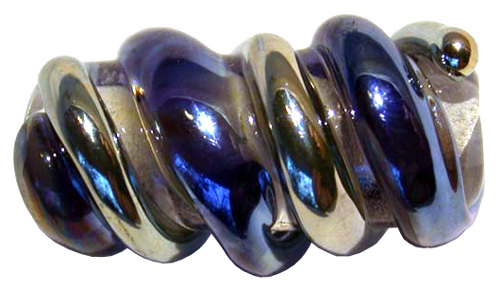 The bead below has both Moody Blue and Purplescent glasses spiraled around a clear glass core. Read about them, Black Diamond, the soon to be released Black Magic and the two new colors, Honey Glaze and Royal Purple (pictured below). BellaDonna Glass is also available in frit in all the colors - Moody Blue, Purplescent, Black Diamond and the two new colors, Honey Glaze and Royal Purple. Soon to be released is Black Magic, a very dense black that reduces to metallic silver. BellaDonna Glass page. Registration is fast, easy... and FREE! There are no commitments - no obligations. Fill out the simple form and you'll receive your first Hot Yellow Flyer (HYF) in minutes. The Artisan Advantage Program keeps you informed and saves you money. Sign-up now. Sale limited to stock on hand. Sale is over when this notice is gone or listed date has expired. Signature photograph at top of page by Doug Baldwin.